This week saw the start of a new era for the management of HRB as Marilyn Price stepped down as Chairman after just over 8 years. 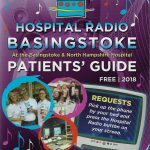 During that time, the station has built and moved into brand new studios at Basingstoke and North Hampshire Hospital, as well as expanded the team with ward visitors and started broadcasting online. Chris Fox was elected as the new Chairman and Anne Wadsworth and Nathan Freeman were newly elected to the committee as Fundraising Officer and Training Officer respectively at the station's AGM which took place on Monday.